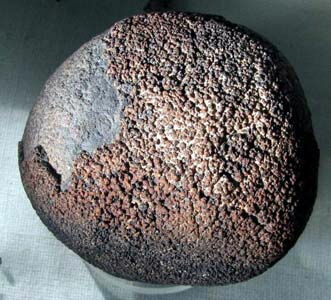 On a photo - standard of meteoritic iron, known as El Inka (Chile). Exceptionally rare mineral. Does not form well well-educated crystals; be found as small grains, painted in grey to whitish color. Other forms are plates and shallow aggregates into other minerals. A malleable ductile silvery-white ferromagnetic metallic element occurring principally in haematite and magnetite. It is widely used for structural and engineering purposes. See also steel , cast iron , wrought iron , pig iron . Symbol: Fe; atomic no. : 26; atomic wt. : 55.847; valency: 2,3,4, or 6; relative density: 7.874; melting pt. : 1538oC; boiling pt. : 2862oC. Related adjs: ferric, ferrous. Form of crystalline excretions. Dense grains with wrong windings outlines. Body-centered cubic lattice, bcc lattice (for low temperature modification). 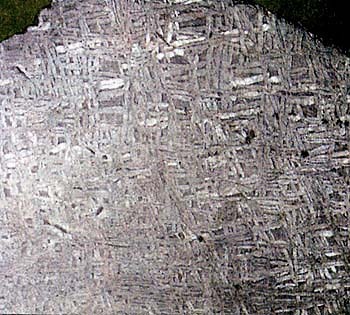 Meteorite iron of name "Sachem" (saw cut). A photo: © A.A. Evseev. As "Supreme leader (chapter) of confederation of the Sonth Indian tribes of the USA"
Strong paramagnetic, ability to dissolve in acids, in the conditions of humidity very quickly to oxidize. A high capacity for oxidization hinders formation of high-cube of native iron. Native iron be found rarely. It appears at renewal of compounds of iron on coal deposits. More frequent there is meteoritic iron. For him alloys are characteristic with a nickel and cobalt, correlations of these elements are changeable thus. 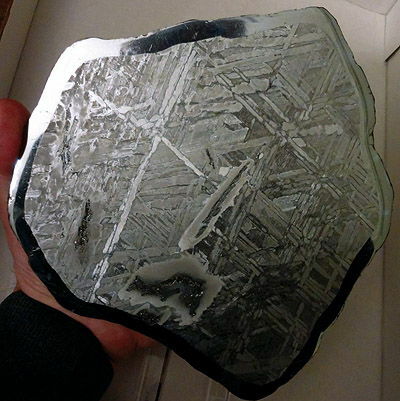 If gland more than 93%, mineral name kamacite (an alloy of iron and nickel, occurring in meteorites). The most known location is an island of Disko (Greenland). From other it is possible to name Byul' under Kasselem (Gessen). In respect of meteoritic iron, it is found quite by chance. Native iron practically in any way is not used. 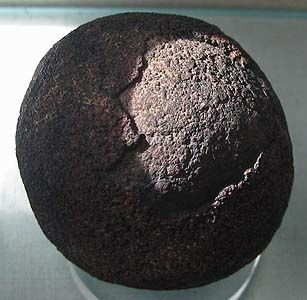 Iron in industry obtain from ore.
Iron-manganese concretion. Pacific ocean. 5 sm. A photo: © A.A. Evseev.